Brussels, Belgium: June 21, 2018- Chairman Kashmir Council EU Mr Ali Raza Syed has said that India uses different brutal methods in order to press Kashmir’s movement. He was addressing a protest demonstration near Indian Embassy in the diplomatic enclave Islamabad, the capital city of Pakistan. The gathering was arranged by different journalist’s organizations of Azad Kashmir including CUJ AJK, Central Press Club and Press Club Mirpur against murder to famous journalist Shajaat Bukhari in Indian Held Kashmir (IHK). 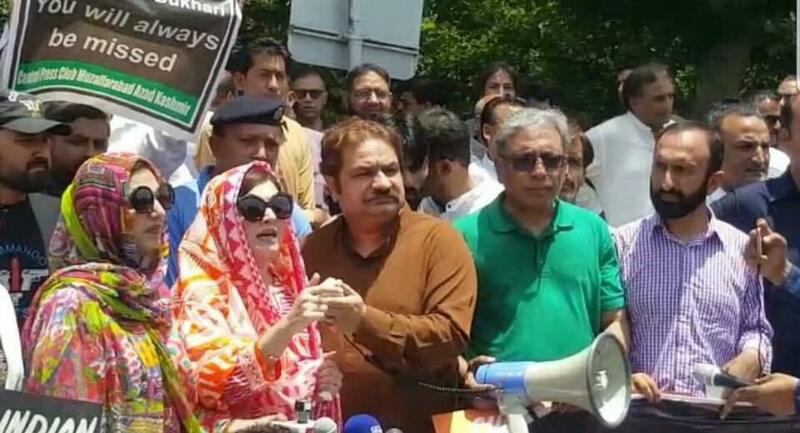 The protest was also attended by Mashaal Malik (the spouse of Yasim Malik), political figures of AJK Latif Akbar and Ch Yasin and many other political figures and journalist from AJK and Pakistan. Mr Ali Raza Syed, by murdering Shujaat Bukhari, India tried to press voice of peace in Kashmir but people of Kashmir will not allow this conspiracy to be achieved. Chairman Kashmir Council EU praised the efforts of martyr Shujaat Bukhari for a peaceful resolution of Kashmir issue. Ali Raza Syed further said, India is involved in brutal act of state terrorism in IHK and recent report of United Nation on human rights revealed real situation. This is for the first time, UN’s report exposed Indian real face under the garb of so-called democracy in IHK. Chairman Kashmir Council EU pointed out, murder of Shujaat Bukhari was happened for diverting attention of world from the UN’s human rights report regarding IHK. India wants to create fear in IHK in order to smash voice of Kashmiris but its brutal policies remained unsuccessful. Imposing governor rule in IHK is also part of Indian evil designs in the occupied Jammu and Kashmir. Chairman Kashmir Council EU called for international investigation of brutalities in IHK in light of the UN’s human rights report. He asked for earlier and peaceful resolution of Kashmir through dialogue process with participation of people of Jammu and Kashmir. He urged the international community to come forward and play an effective role for prevention of atrocities in IHK and for peaceful resolution of Kashmir dispute.